$16.50 total shipping cost for most orders! We are able to meet Council requirements for most Sydney suburbs for a Fire Safety Certificate NSW areas serviced include Sydney, Newcastle, Gosford, Wyong, Maitland, Central Coast, Hunter, Forster, Port Macquarie, and Taree. Includes the inspection of up to 6 items (not including exit lights). The 6 items can be any of; extinguishers, hose reels, smoke alarms, fire doors, fire blankets or hydrants. If you have emergency or exit lights they require a 90 minute test- add $77 (for up to 6 lights). Our tech will need to inspect and test all existing fire measures before issuing a certificate. It is possible he will find you need to replace, or get other items installed, to meet the Australian Standard. Therefore use the $195 as a guide. We can give you a free quote first. To place your interest in getting a fire safety compliance inspection, or a free quote, please fill in our contact form. Our inspector will get in contact with you, to discuss your needs. Ordering this product is not a binding contract - just a way to find out more! Under the provisions of the NSW Environmental Planning and Assessment Regulation 2000 (EP & A Reg), owners of buildings have a legal obligation to supply the Commissioner of the NSW Fire Brigades with a copy of any Fire Safety Certificate and annual Fire Safety Statement listing the fire safety measures applicable to their building. A Sydney Fire Safety Certificate is a certificate that is submitted by the building owner, which certifies that each of the specified essential fire safety measures listed in the Fire Safety Schedule have been installed in the building or on the land and that those measures are capable of operating to the performance standard listed in the Fire Safety Schedule. A Fire Safety Schedule can be issued with the Construction Certificate. The Fire Safety Schedule lists the essential fire safety measures that are to be installed in the building or on the land and the Australian and/or other Standards to which they must be installed. 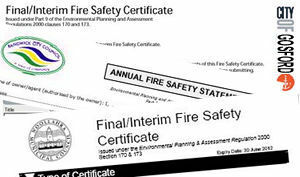 Every twelve months after the Fire Safety Certificate is issued, an Annual Fire Safety Statement must be prepared and forwarded to Council. The Annual Fire Safety Statement must certify that a properly qualified person has inspected the building, assessed the fire safety measures, and found that the measure is capable of performing to the relevant standard. A copy of the statement or certificate must also be prominently displayed in the building. But more importantly, a failure to meet these requirements can significantly affect the levels of fire safety afforded to the occupants of the building, which may threaten their life, as well as having significant liability implications for the building owner.